Now that the cold air is upon us, our heating systems are up and running and the air inside our homes is becoming quite dry. When humidity levels inside our homes reach as low as 10-20%, many of us suffer from dry or itchy skin, nosebleeds, scratchy throats, cracked lips, or even the increased appearance of wrinkles in the face and hands. Do you know that alleviating all of these symptoms can be as simple as installing a single-room humidifier in your bedroom? When humidity is kept between around 30% in your home (or especially where you sleep), our nose, throats, lips, and skin will always be looking and feeling their best! Setting up a humidifier in a single-room that we occupy frequently, such as a bedroom, can make all the difference. Because we are more comfortable in a well humidified room, we will experience better sleep, wake up less often, and wake up feeling more rejuvenated. Benefits extent beyond sleep and our skin, proper humidity will comfort our sinuses when we have a cold or are battling allergies, promote healthier houseplants, protect wood furnishings, reduce heating bills (because heat is transferred more efficiently), and reduce the amount of electric shocks. 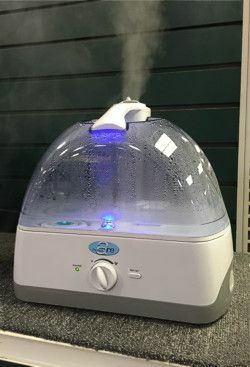 It’s amazing that something as simple as a humidifier could provide so many benefits, but they really do… so how much do they cost and which one is right for me? Single-room humidifiers range in price from about $30 all the way up to $300 so there is an option for every home and every situation. There are less expensive warm or cool mist humidifiers that all sell for less than $70. They are by far our most popular units because they are economical but also very effective, especially when you are talking about using them for only a couple months out of the year! The more expensive units would be the those that work through cold-air evaporation. These units do not encourage an increase in white dust and will often clean the air as it humidifies, so there are a few added benefits to one of these units. Choosing between all of the models available depends on your needs and how much you are looking to spend. If you are interested in home humidification, we invite you to stop by our Plumbing department to see our full selection of humidifiers!